Volunteers are a vital and necessary support to Pegasus Project programs. Without volunteer involvement, Pegasus Project would not be able to adequately carry out its services. In a typical lesson, three volunteers are needed to assist one individual rider. 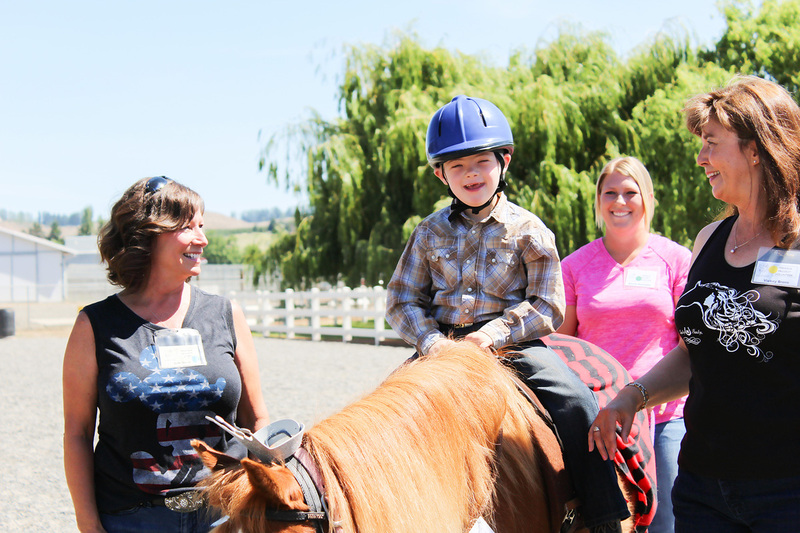 Over 75 volunteers are needed to assist riders in lessons each week! Pegasus Project is always in need of more lesson volunteers to fill such roles as sidewalker and horse leader. Classes are currently being offered 4 days a week, Monday through Thursday, with opportunities to choose a day and time that best fits your schedule. Long term commitments are always valued since experienced lesson volunteers provide stability and familiarity with riders’ goals and needs. We also offer many important non-lesson volunteer opportunities. If you would like to take the next step toward becoming a Pegasus Project volunteer, please contact Teri Clark, Volunteer Coordinator, at 509-965-6990 or email volunteer@pegasusrides.com. You may also submit a completed Volunteer Application for consideration in our next scheduled Orientation and/or Leader Training. If you are signed up for a new volunteer training, please download the volunteer manual here and read through it prior to attending the training. Come prepared with any questions you may have and we will review! If you are a current volunteer, and are signed up for a horse leader training session, please download the horse leader training manual below, and read through it prior to attending the training. Thank you!